These two black and white photographs show Confederate cavalry general Joseph Orville Shelby, (1830-1897). Shelby, a wealthy plantation owner from Waverly, Missouri, began his military career in 1861, organizing and recruiting volunteers for the Missouri State Guard. Commissioned to the rank of captain, he led troops through the battles of Carthage, Wilson's Creek, and Pea Ridge. Recognized for his effective leadership skills and military strategies Shelby rose in the ranks to colonel in 1862 and later brigadier general in 1863. 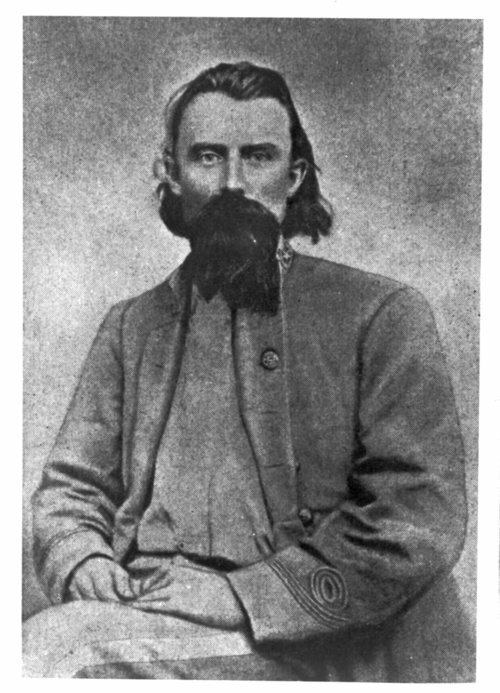 He led his cavalry known as the "Iron Brigade" through the Trans-Mississippi theater into a number of major battles that included Prairie Grove, Little Blue, Westport and Price's Raid. In the closing days of the Civil War Shelby was promoted to major general but refused to surrender and led approximately 1,000 of his remaining troops into Mexico. The men, recognized as "the undefeated rebel", assisted Sterling Price in founding Carlota, a colony for ex-Confederate soldiers. Shelby eventually returned in the summer of 1867 to Missouri where he engaged in farming and various business ventures. In 1893 President Grover Cleveland appointed Shelby U.S. Marshal to the Western District. A position he held until his death on February 13, 1897. Burial was conducted at Forest Hill Cemetery in Kansas City, Missouri. Call Number: B Shelby, Jo. "O"